Cummins Home Energy Savings Project Recap! On Thursday, June 16, a group of 12 Cummins volunteers arrived at Ms. York-Waters’ home for a special Home Energy Savings “Plus” project. Hands On Nashville’s Home Energy Savings (HES) Program engages volunteers to improve the energy efficiency of homes, which on average saves homeowners $390 annually on their utility bills. During this special, HES “Plus” project, Cummins volunteers not only set to work on improving the energy efficiency inside the home, but made tremendous improvements to Ms. York-Waters yard, as well. Before the project, the house was “leaking” a significant amount of air, meaning cool was air escaping into warm places, and warm air escaping to cold areas. This is in large part due to an addition to the house made many years ago. Leaking air is one of the main causes of high energy bills, as it requires HVAC units to work harder throughout the year to maintain temperatures. To remedy this issue, volunteers caulked around each window, and added weatherstripping around windows and doors. As soon as the volunteer set to work, they could tell the impact was going to be immense. Beyond the Home Energy Savings scope of work completed inside, Cummins volunteers set out to improve an outdoor portion of her home. After rain storms, large amounts of water pooled in one low-point in her yard, eventually leaking right into the lower level of the home. To remedy this issue, volunteers built a beautiful rain garden complete with native grasses and plants that will absorb water before it can reach the home. One of the volunteers who helped build the garden was Kathy Pessefall, a Cummins employee who has helped on multiple HES projects now. When asked why she enjoys the process, Kathy simply said planting rain gardens is one of her favorite project activities. As the project drew to a close, Ms. York- Waters expressed sincere gratitude for all of Cummins hard work. “I learned a lot about how much air leakage we have and much about what we never knew about our home before today,” she said. To learn more about the Home Energy Savings Program and how you can get involved, please visit HON.org/hes. Meet the Arnetts, a family of four, who live in South Nashville. Volunteers brightened this young, growing family’s home in the winter of 2014 through the Home Energy Savings (HES) Program. Volunteers have made over 275 homes more energy efficient through this program, saving homeowners an estimated $275,000 since 2011. “In a city where affordable housing is getting harder and harder to come by, I think Hands On Nashville is one of those few [agencies] working from a different angle in trying to make living in Nashville more affordable,” observed Ryan, a father, husband, and HES homeowner. He explains how saving energy ultimately leads to saving money. Saving money is crucial for HES homeowners, who earn an average of 50% below the city’s median family income. Metro Social Services reports that utility cost assistance is the most frequently identified unmet community need in Nashville. Hands On Nashville’s HES Program seeks to address that need through volunteerism. Be a part of that ripple. Be a light. Give a light. Support Hands On Nashville through the Community Foundation of Middle Tennessee’s #BigPayback on May 3! Meet Steve, a Home Energy Savings (HES) Program Volunteer. This group put in a valiant effort on 50K tree day! On Feb. 27, 2016, university groups, high school students, corporate teams, and more came together to plant 378 trees during the statewide effort to plant 50,000. The 378 trees HON volunteers planted will offset an estimated 1,631.1 tons of carbon over time. What better way to spend spring break than helping out in the great outdoors? In honor of Veterans Day, Hands On Nashville partnered with Operation Stand Down Tennessee (OSDTN) to improve the energy efficiency and comfort of homes in which Veterans live. During each of the four projects, Veterans volunteered their time to support their fellow servicemen and servicewomen. 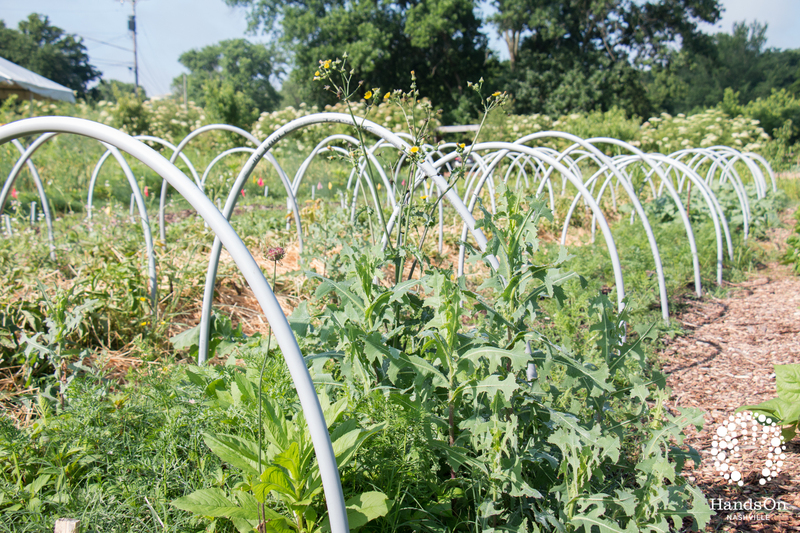 Hands On Nashville’s Urban Agriculture Program Earns International Award! We’re pleased to announce Hands On Nashville’s Urban Agriculture Program earned third place in the teaching youth category for the 2015 INUAg Innovators in Urban Agriculture Prize! This award recognizes schools or youth focused programs working with children and teens to teach them urban farming. To learn more about this international honor and view other recipients working to improve urban agriculture across the globe, click here. Crop City 2015 – Final Recap! Time flies when you are having fun (and gardening and cooking delicious fresh food!). It’s been a great summer of learning, gardening, and eating at the Hands On Nashville Urban Farm. For six weeks, our 2015 Urban Agriculture Teaching lead their peers through a hands-on curriculum that aimed to positively impact knowledge and behavior around eating. They did a wonderful job! And while it won’t show up in any numbers or future learning menu, we shared a lot of laughs, games, smiles, and good food with a great group of participants. Ms. Brooks and Hands On Nashville Volunteers following a Home Energy Savings Project in April 2015. Ms. Brooks, now retired, is an avid churchgoer, a proud new grandmother, and a homeowner in East Nashville. Before volunteers completed a Home Energy Savings project in her home this April, Ms. Brooks was paying as high as $400 per month for her energy bill alone. Shortly after her project was completed, Ms. Brooks called Hands On Nashville with good news.